Pharmaceutical patent grants in India (2009-2016) which relate to biologics, an emerging class of drugs. 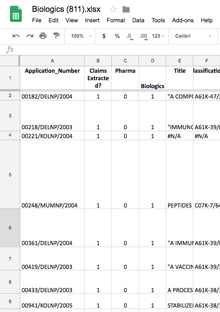 This data set contains all 811 patent applications that were granted by the Indian Patent Office (IPO) between January 2009 and December 2016, which relate to biologics, an emerging class of drugs. Pharmaceutical patent grants in India (2009-2016) which relate to process claims. 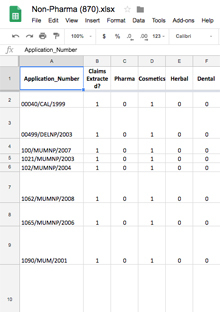 This data set contains all 903 pharmaceutical patent applications that were granted by the Indian Patent Office (IPO) between January 2009 and December 2016, which relate to applications that made process claims. A61K patent grants in India (2009-2016) which do not relate to pharmaceuticals, comprising herbal medicines (302), cosmetics (233), dental products (70), and other unrelated categories (265). 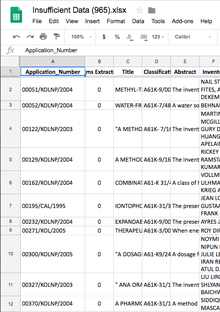 This data set contains all 870 patent applications that were granted by the Indian Patent Office (IPO) between January 2009 and December 2016, under the category A61K, but for what can be broadly classified as non-pharmaceutical inventions. Pharmaceutical patent grants in India (2009-2016) for which there is insufficient data in the Indian Patent Office records. 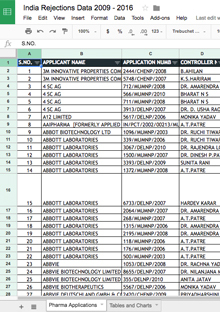 This data set contains all 965 pharmaceutical patent applications that were granted by the Indian Patent Office (IPO) between January 2009 and December 2016, but for which data is unavailable or insufficient owing to record-keeping errors. This data set contains all 1723 pharmaceutical patent applications that were rejected by the Indian Patent Office (IPO) between January 2009 and December 2016. The pharmaceutical applications covered include those rejected solely by the IPO as well as those rejected by the intervention of third parties in the form of pre-grant oppositions. 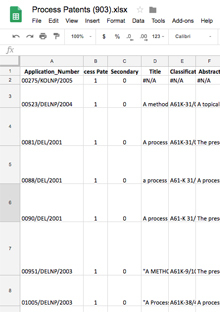 For further notes on methodology, as well as to see our analysis of the data, please see the corresponding report under the 'Arguments' tab: Rejected in India: What the Indian Patent Office got Right on pharmaceuticals patent applications (2009–2016).